with decision-makers, donors and practitioners, requests for specialist partnership brokering support grows. As pioneers in this field, we respond to all requests for information, capacity development and support in a spirit of exploration and enquiry. We seize opportunities to share our experiences and insights as we accompany those involved in developing partnering strategies, approaches and programmes. 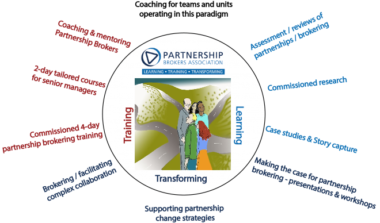 Our Brokering Better Partnerships one-day workshop provides a useful entry point to better partnership working within single organisations, partnerships, consortia or alliances as well as in new contexts where partnering is less developed. Our New Initiatives evolve from working with others and identifying gaps in provision that we can help to fill. See: Transforming for more details. Our Programme Partnerships provide an opportunity to work with others for longer periods that add more value over time, build local capacity and explore new materials and approaches. We also have a number of collaboration agreements in place with organisations we accompany on their partnering journey over time. For a list of organisations for whom we have provided commissioned Partnership Brokers Training go to Commissioned Training. We are always curious and welcome discussions about what might be useful and how we can help. If we do not feel we can meet your specific needs we will gladly signpost you to others who can.